Interested in making some cool and elegant handmade jewelry? Not sure how to start, what materials, or even what tools you will need to get to work on some projects? 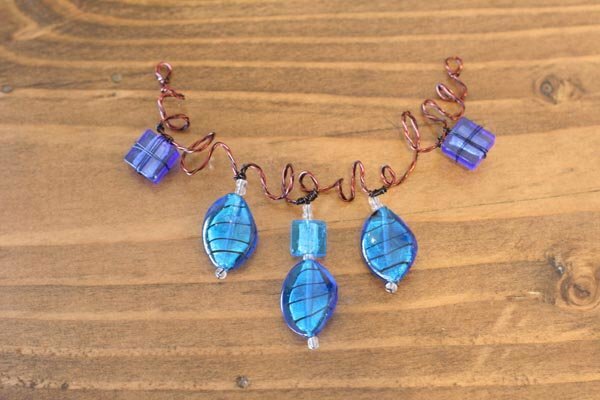 Today we are starting you off with a basic tutorial on how to make a wire vine necklace using glass beads and copper jewelry wire. We will cover all the tools needed, materials, and options you have to make your necklace an original design. These handmade jewelry pieces can be made as gifts, wedding accessories, or even sold at a local market if you are an aspiring jewelry entrepreneur. To start the base of our vine section, we need to first braid or twist together a few strands of wire. Visit our tutorial on making braided jewelry wire to see how to make your own. Those of you who have already done our lesson on how to twist braided jewelry wire are now ready to go, using the very wire we made from that lesson! The samples below gives you an idea of the different styles of vines you can get by changing the colors. You are by no means limited to the examples you see here. Using our twisted wire that we made from two lengths of brown wire and one length black wire in the middle, we cut a 1.5-foot section from our braided wire. You can, of course, make it longer or shorter to fit the designs you have in mind. When picking lengths to cut, keep in mind that your braided wire is going be bent in endlessly different ways to make a vine. A very long section will soon be short with the more twists you put in the final shape. When in doubt, start with a piece much longer than you think you will need. We are going to just start bending, turning loops, twisting it around our finger, and doing pretty much whatever naturally happens to get the desired shaped vine. There really is not a wrong way to do this step. I just keep bending and tweaking the shape with my hands until I like what is in front me. You can do this by hand easily, but when using thicker wire you can also use round nose and nylon-tipped pliers to bend the wire without scratching the color off. This comes with the added benefit of giving your hands a break. You will want to leave a good 1-inch section of straight wire coming off both ends of your vine piece, as these will eventually be used to make the end loops for your chain to attach onto. You will want to leave a good 1-inch section of straight wire coming off both ends of your vine piece, as these will make the loops for the chain to attach. Using our round nose pliers, we gently hold the wire. If we hold too tightly, the color finish on the wire can scratch off. Gently take the tip of the straight end of wire and roll it around the front of the pliers until you get a U shape. Keep going until the wire crosses back over the vine, resulting in a P shape. Then wrap the end length down and around the main wire, cutting off any excess. Using your flat nose pliers, carefully roll the sharp cut-off ends of the wire down so they face into the other wires and no sharp bits are sticking up towards where your skin will be when you wear it. Using your cutting pliers, cut the fishing line used to keep the beads together and carefully let the glass beads slide off onto the table. Make sure to keep those free, little clear beads that come on the strand, that way you don't have to buy some to use in this piece. If the strands you purchased don't come with these little clear bumper beads like ours did, you can use any small beads you have at home, or buy some separately when you're buying your glass beads. This step is just simply laying out your design on a flat surface so you can see what it is going to look like and help you plan out the arrangement. Cut off a few 8-inch sections of 26 gauge black wire to make the wire bead strands to attach to the vine. We have 5 hanging bead sections in this example, so we will need to cut 5 sections of black wire for each length of beads. We first thread on one clear small plastic bead (don't use glass, plastic is stronger) to hold the other beads on. This is the end bead that will be tied in place on the wire. Just thread the wire through the bead and loop it over as shown. Thread it, then loop it back over the outside to thread through bead again. For this portion of my necklaces, I normally always just use the clear beads that typically come with store-bought strands. Why let free materials go to waist? Should you NOT want to use any kind plastic at all in your jewelry, you can alternatively use a crystal bead as an end cap of the strand you make. Real crystal is stronger then glass, but they cost a little more. Such is the price of art. Once you've passed your black wire through the bead once, loop it over and thread through again. After you've threaded through twice, use your pliers to pull the wire taught around the bead. This will now serve as the end/stop point of your strand. Use pliers to grab and pull tight to tie the bead in place as the end cap bead. How this lays out is entirely up to you. Please your beads in whatever sequence you want down the strand. With your tied on bead now, just thread the beads on in order to your design layout, they will rest on the end bead. Once you have the number of beads you want threaded, cut off any excess wire that remains on the bottom. The end you are cutting is the end which will hang below your necklace, NOT the end that will eventually be affixed to the necklace. Cut off the excess wire at the tip of the end cap bead. We are now going to wire wrap the square purple glass bead in our collection, and we are going to do it packaged twine-style. We thread the wire through the glass bead first and leave the bead in the middle of our strand. Place bead in the middle of the wire section. Then we loop it over the outside a few times. Thread the ends of the wire through the bead after looping it over the outside of the bead. Then, just like you would a package with twine, loop your two opposing lengths of wire up and around each other, twist the strands together in the middle, and wrap around the front again a few times. Loop the two ends of wire to the back of the bead, then twist like you would a twine package. Then wrap it around the front making your cross of wire on front. Then twist the two ends in the back again. Cut the extra wire so we are left with one long wire to attach to the vine. Cut one wire end, and leave the other and bend up to attach to vine piece. Hold your finished bead strand and wrapped squares, up to the location of the vine you wish to attach them to. Then slowly wrap the end of wire around the vine, as tight as possible, without damaging the vine. The strand of bead we made, ready to attach to the vine. Where you put them is entirely up to you! TIP: We do one good tight wrap to hold it in place, which lets use reposition the piece to help keep wrapping it without moving the end location of the strand. With each bead strand you put in place, cut off the excess once it is tightly wrapped around your vine. Once you have wrapped it enough, or more if you like to see more of the wrapping along the vine. Cut the excess wire off, and twist the thin wire around the vine so no points stick out. Once you finish wrapping on the other bead strands and wrapped squares, you will have your finished necklace center piece. Really the chain part is optional, as you could easily just attach a cheap jewelry chain laying around to the ends of your vine and be done. BUT THAT'S NOT THE DIY Projects WAY! We are using jump rings made from our 20 gauge brown jewelry wire, using our very own Jump Ring Mandrel. You might want to check out that tutorial as well, especially if you plan on making a lot of jewelry. You can also buy pre-made jump rings from the craft store but…THAT”S NOT THE DIY Projects WAY EITHER!!! We use our flat nose pliers to hold the loops and bend them open or closed. On thin small wire like this, I find it easier to just work with my fingers, though it can get a little painful over time. Pliers help if you have them or if you want to save your fingers from building up calluses. No real need for paper towel, we just used it to help with seeing the thin wire jump rings as we work for the tutorial. You are going to build a jump ring chain in the following sequence: 1 ring / 2 rings / 1 ring / 2 rings / 1 ring, and so on, alternating back forth until you have two equal lengths needed for each side the neck. We made two sections of chain that are 4 1/2 inches long each to use on this necklace. Both ends of your necklace should end on a single jump ring section, not a section of chain with 2 jump rings. Just keep going until you have two lengths to match how low or high you would like your necklace to be. Our two sections of chain are 4 1/2 inches long each. Making it easier to take off your necklace without messing around with complicated barrel clasps sounds good, so we went with magnets. These are available at any craft store and come with threaded tips for you to feed your wire through. You're going take one end of each jump ring chain and bend that jump ring back open just enough to get the clasp hole through the magnet, and close the jump ring back up. Then do the same thing with your other section of chain. The end result is a 9-inch jump ring chain (your two, 4 1/2-inch sections) with a magnetic clasp in the middle of the chain. We have one of two 4.5 inch chains we made, ready to be attached to a clasp. Now we are going take our jump ring strand with its magnetic clasp in the middle and affix either end to our necklace vine. Open the jump rings on either end, place them over either end of the vine loop, and close the ring. One side down, chain attached, with magnet clasp ready, onto the other side to finish attaching side two of chain, and you're DONE!!! step 22: Enjoy, gift, sell, make more! !